^ WisBar | Pioneers in Law: Rhoda Lavinia Goodell Archived 2009年6月2日, at the Wayback Machine. 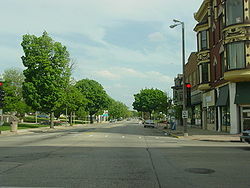 ^ Janesville Wisconsin Fun Facts Archived 2010年12月23日, at the Wayback Machine. ^ NRIS Search by location Archived 2008年9月23日, at the Wayback Machine. ^ Wisconsin Center for the Blind and Visually Impaired Archived 2012年4月2日, at the Wayback Machine. ^ Common Cause in Wisconsin: Tim Cullen to join CC/WI state governing board Archived 2016年1月25日, at the Wayback Machine.